3 Bedrooms, 2 Bathroom, great location, in a private 1/4 acre lot. La Pela 1, is a comfortable Manufactured Home Completely and Tastefully Renovated located in a private owned , country side of Orlando, 1/4 Acre Lot , 8-10 Minutes From Orlando International Airport. The neighborhood is named "Taft". Taft is an old Community of mostly manufactured homes. The neighbor looks a little bit run down and industrial but Taft is a wonderful community where everyone know each other and is near everything in Orlando, Florida. It is a very mixed community, with lots of great people. It is like been in the country side of Orlando and is very quite far away of the traffic and noise except that at night you may hear far away the passing of the train. 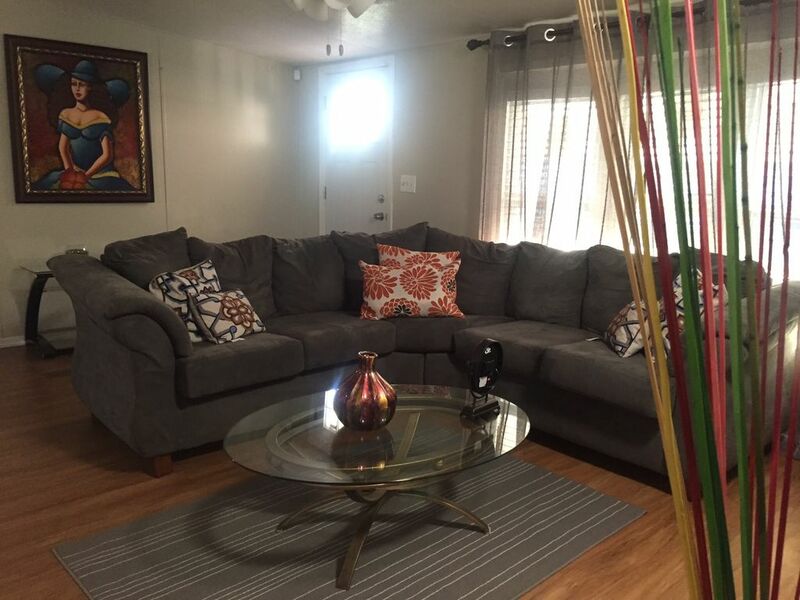 My house is spacious, comfortable and has eveything you need for a great stay in Orlando. It is very central to visit all the theme parks, shopping centers, local attractions, restaurants, the International drive for conferences but you need a car though. Huge fenced and safe patio for your pets. It's less than 5 minutes driving to Florida Mall (in our opinion, the best and largest mall in Orlando), Marshall's, Walmart, gas stations, pharmacies, Best Buy store. Several restaurant is within less than 5 minutes driving distance of the home!!! Guest access : All amenities are close by and within a 2 -4 mile (max) radius included fast food restaurants, grocery stores (walmart, publix and Walgreens), a number of clothing stores and petrol (gas) stations. Access to the I-4 main highway (Daytona-Orlando-Tampa) is very simple and less than 5 minutes drive before you are on the highway heading towards the theme parks and Minutes from all Mayor Highways 528, I-4, 417. Located Just 10-20 minutes from Central Florida's Most Visited Theme Parks and Shopping Outlets, Orlando Convention Center, Premium and Prime Outlets. Only 5 minutes from The Florida Mall. The property is beautifully furnished and includes a 47" TV with DVD player in the living room and a 32" TV's in then queen bed master room . TV included the Basic channels : 100 standard channels . Also a fully equipped kitchen, a laundry area with full size washer and dryer . There is a dining area with formal dining table that seats 6. - while the two other bedrooms have one full bed and 2 twin beds, both have walk-in-closets. The property has a big porch consisting of 6 chairs and a table and a patio with BBQ and a table with 4 chairs. Linens, towels, dishware, cookware and utensils are provided. *Safe Fenced Property with control remote chainsaw gate parking lot . We have FREE high speed internet , Wireless WiFi, guaranteed !!!!! 15 mega. ***Fenced patio great for pets. * We have Flexible fast and effortless Check-in and Check-Out!!!!!! -Check-in time is 3PM but you can arrive at anytime. * Keypad access : Will provide a code number or electronic Key to get in into the house through a keypad access to open the MAIN DOOR . The CODE will be given to you prior to check in. - Check OUT is 11:00 AM and flexible. * Miki, the owner, will always be just a call or email away for anything that our guests want to tell her personally. * She also speak Spanish and English. * Please let us know if you have any questions by e-mail or phone. We are happy to answer any questions you have before your visit and we look forward to welcoming you to Orlando. This is a quiet area. Occasionally and from time to time you can hear "The train whistle at night". I recently finished the renovations making it very comfortable, new and charming. * I live a 15 minutes driving from the property if you need me. My job is to make sure that you enjoy your stay at your home away from home. If I can be of any help with recommendations of places to go to have fun just text or call me at anytime, I am here for you 24hrs a day if needed. Note: Advice your own car or rental car for transportation. Public transportation it's not available near the property!!!!!! -Universal Studios' Islands of Adventure 6.4 miles. 45 minutes from Kennedy Space Center, Cape Canaveral Sea Ports which is Home to Disney Cruise Ships, Carnival Cruise Ships and Royal Caribbean, Making this Property a Real Hot Spot. - Cocoa Beach - via FL-528 E- 54.7mi (1 hr 1min). • Mop and cleaning supplies are in the laundry area or in the patio. •Dishwasher soap is under the sink kitchen cabinet. - Only we provide Bath towels, We DO NOT provide Beach Towels. during the season, please buy some for your own use). ***Never inside Property*** Only Outside Please. You have a nice porch area and back yard. This is a Non Smoking home. If you smoke , please do so outside of the house and place buts in ash cans. Do not toss on the grass. Bathrooms: 2 Bathrooms Both Bathrooms with toilet, and shower (Huge walk in shower). All towels are new, Both bathrooms are newly renovated. Nice,clean and cozy house, near to all the parks. We enjoyed the stay here. Perfect home in quiet location. Very comfy! Lovely home with extra large fenced in yard. Dogs enjoyed the space to run and play. I have to say I was completely surprised on this rental. Not only was it clean, decorated very nicely, neighborhood was so quiet and the owners were just OUTSTANDING to work with. This house was so close to SeaWorld and other fun activities and only 20 min from Disney. It was so perfect for our family and truly made our vacation the best one yet. I will definitely stay here again! Also LOVED the fenced yard for our dog and all the security the house had. Folks for the money you can't beat this house! We really liked the yard and fence. Our dogs had a great time exploring. Somethings in the house need to be done for the long term renter. Silverware needs more. Pans our warped so need replacing especially the fry pans. More room in kitchen to put things in. Another clock in the living room or kitchen would help. More dish towels and dish cloths. I did leave some. A crock pot would be good and a mixer would help. I did appreciate the sharp knifes. Better lamps in bedrooms. Hope you had a safe trip back home. I am so sorry about the inconvenience. Most of our long term renters call us in advance and let us know their needs in advance. Most of the time, long term guests ( greater than 4 weeks) bring their own bed sheets, blankets and towels. Next time please let us know in advance what are your needs. Thank you so much!! I know the neighborhood is a little bit run down but they are very good people living there for years!!!! *5 -8 Minutes From Orlando International airport. Car necessary . Public transportation In Orlando , FL area is very poor . If your flying from home strong Advice to rent a car . Another option is taxis or cabs!!!!!!! -Universal Studios' Islands of Adventure -6.4 miles.